Las Vegas played a key role in the evolution of the slots market and it is quite fitting that this slot from Scandinavian-based developer NetEnt is a tribute to Sin City. Twin Spin is a 5-reel, 243-ways-to-win slot that is packed full of symbols you might see on a classic Las Vegas casino floor slot including diamonds, cherries, bells, the number 7 and the iconic bar symbol. The slot comes with a Wild symbol that appears on reels 2, 3, 4 and 5. It substitutes for all other symbols to complete winning combinations. The other symbols are represented by the 9-through-to-Ace symbols. The vibrant presentation of the reels will get you right in the Las Vegas party mood. The reels encapsulate the spirit of Las Vegas in a similar way to the Sheriff Gaming slot Las Vegas Fever with bright lights and plenty of color. The letter ‘s’ in the word ‘spin’ is even replaced by a ‘$’ sign. That’s very Vegas! There are 10 levels that players can bet on and there is a maximum coin bet value of 0.50 per spin. It is possible for you to win up to 270,000 coins on this slot which is quite a breathtaking sum. At Least Two Locked Reels Every Spin! 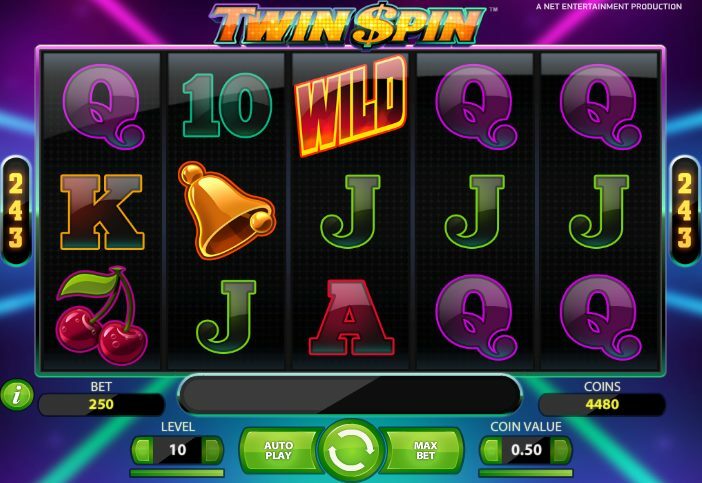 Twin Spin offers a unique feature for a slot game that is hinted at in the title. Every time you click to spin the reels at least two of the reels become locked together and spin at the same speed with the same symbols appearing next to each other. Yes, you did read that right. At least two reels! So there is the chance that you could see three, four or even all five reels all linked together with identical symbols appearing on all five reels next to each other. Slots purists that love a good old free spins bonus round or Pick ‘Em Bonus will be disappointed here but I appeal to those of you that might initially shun this slot for its lack of bonus features to just hold your judgment. 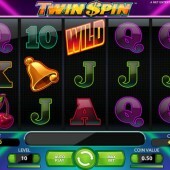 Twin Spin is a slot where something will happen with almost every spin thanks to the locked reels on every spin. This feature means that there is a greater chance than in any other slot out there of hitting five of the same symbol and triggering some big winning combinations. Twin Spin was one of the most highly anticipated slot releases of 2013 with even the likes of NetEnt’s mystical-themed Secret of the Stones and Microgaming’s massive release The Dark Knight Rises attracting less attention. Having played it, I can tell you now that this slot matches the hype.